Peter Jackson. Beyond the Balance of Power: France and the Politics of National Security in the Era of the First World War. Cambridge: Cambridge University Press, 2014. ISBN: 9781107039940 (hardback, $110.00). 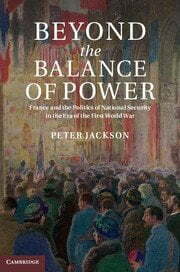 Peter Jackson’s new book, Beyond the Balance of Power, constitutes a welcome and valuable contribution to this field for several reasons. The book expands the time-frame not forward into the 1930s as is most often done, but backwards, into the pre-war and wartime periods. Another and no less important reason is Jackson’s conscious effort to integrate state and non-state actors in a single analysis through a case study of French security policy before, during, and after the war. The result, as all four reviewers agree, is an ambitious book that will mark the historiographical landscape. The four reviewers, three historians and one international relations scholar, are all leaders in their fields, and all have worked on subjects that touch directly on aspects of Jackson’s book. All four, moreover, offer high praise. Keith Neilson writes that the book “forces us to reconsider not only French policy but the nature of the international order in this period;” Glenda Sluga describes the book as “an imaginative and nuanced analysis;” and David Stevenson calls it “the best account of available of French national security policy against Germany during the decade from 1914 to 1925, and one that will remain a standard point for further reference.” Not to be outdone, Brian Schmidt writes that Beyond the Balance of Power “is, quite simply, an absolutely brilliant book.” Among the book’s strengths highlighted by the reviewers are: the immense research and especially archival work upon which it rests; its multi-disciplinary approach, combining history and international relations theory; its use of Pierre Bourdieu’s theory of practice to understand the role of cultural factors; and its revisionist thrust, calling into question standard interpretations of French security policy during and especially after the war. Along with praise, the reviewers raise several thoughtful questions prompted by their close readings of the book. Schmidt asks whether the French version of internationalism, which Jackson identifies as “juridical internationalism,” can be clearly distinguished from Anglo-American liberal internationalism, which itself was multi-dimensional. Sluga asks whether Jackson has gone far enough in integrating social history into international history, an effort, she suggests, that would make social movements, rather than states, the principle subjects and actors. And Stevenson asks whether a study focused on France can be considered as international history. In his response, Jackson carefully addresses each of these questions. Because the French versions of internationalism were so rooted in French political culture and practice, they were in many ways unique. In largely ignoring French internationalism, historians risk misunderstanding French policy and IR scholars risk misunderstanding the early history of their discipline. Regarding the integration of social and international history, Jackson contends that it is difficult to conceive of an international history of this period that does not accord a prominent role to states and the political, military and diplomatic elites who were responsible for determining state policies. Finally, in answer to Stevenson’s query, Jackson points to the existence of a depth-versus-breadth trade off in international history: what is gained in breadth in examining the interactions between several states risks being lost in depth as each individual state receives less attention. If so, there is surely something to be said for sometimes choosing to emphasize depth over breadth. In the end, these are all big questions that deserve wider discussion. Beyond the Balance of Power is an impressive book for many reasons, not the least of which is that it prods readers to pose big questions and, in so doing, to think hard about the nature of international history. Peter Jackson is Professor of Global Security at the University of Glasgow. He studied at Carleton University, the University of Calgary and the University of Cambridge. He has also held research and teaching posts at Carleton University, Yale University, the University of Wales at Aberystwyth and Strathclyde University. He is co-editor of Intelligence and National Security, and has written widely on the history of international relations in the first half of the twentieth century as well as the role of intelligence in decision-making. He is now working on a history of statecraft. Talbot Imlay teaches in the history department at the Université Laval in Québec, Canada. He is the author of Facing the Second World War: Strategy, Politics, and Economics in Britain and France 1938-1940 (Oxford University Press, 2003). His most recent book, co-authored with Martin Horn, is The Politics of Industrial Collaboration: Ford France, Vichy and Nazi Germany during the Second World War (Cambridge University Press, 2014). He is currently writing a book for Oxford University Press entitled The Practice of Socialist Internationalism: European Socialists and International Politics, 1918-1960. Keith Neilson is Professor Emeritus in the History Department of the Royal Military College of Canada. He received his undergraduate education and MA from the University of Alberta and his PhD from the University of Cambridge where his supervisor was Norman Stone. Professor Neilson is an expert on Anglo-Russian/Soviet relations and on British strategic foreign policy in the period from 1850 to 1945. He is the author (or co-author) of five books and has edited eleven others. His most recent book (with T.G. Otte) is The Permanent Under-Secretary for Foreign Affairs, 1854-1946 (London and New York: Routledge, 2009). At present, he is writing a book on British policy towards the neutrals, 1939-41. Brian Schmidt is Associate Professor, Department of Political Science, Carleton University. His publications include International Relations and the First Great Debate (Routledge, 2012) and The Political Discourse of Anarchy: A Disciplinary History of International Relations (SUNY Press, 1998). Glenda Sluga is Professor of International History at the University of Sydney. Her major publications include Internationalism in the Age of Nationalism (2013), The Nation, Psychology, and International Politics (2006), The Problem of Trieste: Difference, Identity and Sovereignty in Twentieth Century Europe (2001). From 2014-2018 she is an Australian Research Council Laureate Fellow and director of the ‘Inventing the International’ research program, and she is currently writing a history of the Congress of Vienna. David Stevenson holds the Stevenson Chair in International History at the London School of Economics and Political Science. His publications include French War Aims against Germany, 1914-1919 (Oxford University Press, 1982); The First World War and International Politics (Oxford University Press, 1988); Armaments and the Coming of War: Europe, 1904-1914 (Oxford University Press, 1996); 1914-1918: the History of the First World War (Penguin Books, 2004); and With Our Backs to the Wall: Victory and Defeat in 1918 (Penguin Books, 2011). He is currently preparing a book on the international history of the year 1917. It is a reasonably frequent occurrence that a book completely challenges a well-established interpretation of events. But, it is a rare occasion that it does so successfully. This is one such case. Peter Jackson, the author of a highly-regarded study of French intelligence and foreign policy in the 1930s, has provided an examination of French foreign policy from before the First World War to Locarno that forces us to reconsider not only French policy but the nature of the international order in this period. In the accepted version of French policy in this period, it was driven by the idea of securité d’abord. How this security was to be obtained varied with time. Before the First World War, it was sought via the balance of power, with the Franco-Russian Alliance and the more tenuous Anglo-French entente providing Paris with the means to check the burgeoning power of Imperial Germany. Such an interpretation underpins all explanations of the French role in the origins of the 1914 war. So, too, does it provide the foundation for interpreting France’s position at the Paris Peace Conference and in the immediate post-war period, when French policy is seen as driven by a desire to prevent any recrudescence of German power by binding agreements with other Powers. Jackson replaces this framework with a different one, utilising both the traditional archival sources of diplomatic history and insights gained from the social sciences. This book, then, is at least in part an example of what has been termed the ‘cultural turn’ in international history. While avoiding the bloated vocabulary of much work in the social sciences, Jackson carefully uses the ‘practice theory’ of Pierre Bourdieu to discuss how French policy was made. This in itself is an important contribution to international history generally and here explains clearly how differing concepts of security shaped the views of the several groups that formulated French external policy. Jackson shows that in addition to the well-known concept of the balance of power, there were other traditions of how to achieve the goal of security. One of them, derived at least in part from the French juridical tradition, sought to enmesh Germany in the European comity of nations, the latter ruled by international law. This approach had strong roots in French legal practice and shared characteristics (the idea that greater links between nations derived from trade) with aspects of British liberalism. It also had manifested itself in how to effect arms control at the two pre-war Hague Conferences. While the ideas of balance of power naturally were predominant during the First World War, at Versailles and during the immediate post-war leading up to Locarno, the idea of attaining security through international law – here the League of Nations was important – and increased economic linkages with Germany was not completely submerged. In fact, when such post-war crises as the occupation of the Ruhr undermined the primacy of the balance of power concept, French policy under the Cartel des gauches governments strove to implement a hybrid policy that ‘internationalised’ French security while at the same time maintained elements of the traditional balance of power approach. Understanding this latter sea change in French policy is an important point for those interested in the nature of international politics in inter-war Europe. Rather than seeing the French as clinging obstinately to the provisions of Versailles, unwilling to accept any changes that did not maintain the balance of power, Jackson’s work makes it necessary to reconsider just how the French wished to obtain securité d’abord. The hybrid pursuit both of balance of power and internationalist approaches can be seen, respectively, in France’s construction of the various ententes in Eastern Europe and in France’s championing of the League of Nations and its attempts to provide a legal framework both for the resolution of international quarrels and for disarmament. It also explains, at least in part, why French security policy often seemed incoherent and in flux. Jackson’s argument is a persuasive one, in part because he examines a time frame – roughly 1910 to 1925 – that links pre-war, wartime, and post-war thinking. This is unusual, as the war itself usually is seen as bringing an end to the long nineteenth century and ushering in a completely new era. By looking at the entire period, Jackson is able to highlight the continuities in French thinking about security and show the ebb and flow of the two contending visions for obtaining it. His use of Bourdieu’s practice theory helps explain why some parts of the French policy-making elite (to use Donald Watt’s term ) were more able (and more willing) to accept an internationalist approach to security than were other groupings. This is a nuanced way of looking at things, and something that puts emphasis on individuals and their circumstances (‘agency’) rather than subsuming them within abstract concepts such as balance of power (the staple of the ‘realist’ schools of political science). This book, then, is a trumpet call for a more sophisticated approach to international history and a validation of the need to consider more carefully the various currents of intellectual and cultural history when considering matters of military and diplomatic history. It is an important and ground-breaking contribution to the field. Beyond the Balance of Power: France and the Politics of National Security in the Era of the First World War is, quite simply, an absolutely brilliant book. Peter Jackson has produced a fascinating interpretation of French foreign and security policy in the tumultuous era of the First World War. As we commemorate the hundredth anniversary of the outbreak of what became known as the Great War, Jackson’s international history of this period should be placed ahead of most of the new books being published on the First World War. While Jackson’s primary focus is the impact of the First World War on the politics of national security in France, in 559 pages of text, he considers an extensive range of topics and issues that were at play in the lead up to the war, the conduct of the war itself, and the process of constructing a new international order once the fighting finally came to an end. It is international history at its very best, as he documents the interests and behavior of multiple countries including the United States, France, Russia, Germany, and Britain, considers the influence of non-state actors, describes the role of prominent political leaders and government officials, and factors in the influence of civil society to produce an incredibly complex, and highly readable, account of one of the most interesting periods in the twentieth century. His extensive archival research results in an elaborate story of how French officials and intellectuals thought about peace and security before, during, and after the First World War. Historians will appreciate the careful attention that Jackson displays as he marshals evidence to challenge existing interpretations and support views that have either been marginalized or not considered at all. Others, particularly theorists of international relations, will be intrigued by the manner in which Jackson constructs his account of French foreign and security policy in terms of a dichotomy between what he describes as traditional and internationalist conceptions of security. The distinction between traditional and internationalist approaches to security, which Jackson also describes in terms of a pessimistic versus optimistic understanding of international relations, has, for better or worse, served as a predominant theoretical schism in the academic field of International Relations (IR). As a theorist and disciplinary historian of IR, I will devote my attention to the way that Jackson constructs his narrative of the evolution of French security policy in terms of a contrast between traditional and internationalist conceptions of international security. From the outset, it is important to acknowledge that one of the outstanding merits of Beyond the Balance of Power is the interdisciplinary character of Jackson’s scholarship, which dissolves the boundary that traditionally has separated historians from political scientists. It is obvious that not only is Jackson conversant with the historiographical debates surrounding the First World War in general, and France’s involvement in the war in particular, but also with the theoretical debates in IR. Jackson’s primary aim is to recover the internationalist dimension of French thinking about national security, which he argues has been missing in the historiography of the inter-war period. To help fulfill this aim, he accentuates the role that ideas and norms have in re-constituting the practice of international politics. More specifically, Jackson focuses on the role of cultural factors in explaining the ideas and policy positions that various French officials held during the period under study. Throughout the book, Jackson does an impeccable job of describing the social and educational backgrounds, as well as the cultural environment, of countless individuals. At the same time, Jackson is cognizant of the material constraints that France encountered during this difficult period and he goes to great lengths describing them. One of the advantages of expanding the chronology of the study beyond the traditional 1914-1919 periodization is that Jackson is better able to record the changing material constraints that France faced from the time the decision was made to enter the war to the period that followed the Treaty of Versailles. This allows him to argue that intellectual space gradually opened for alternatives to the traditional view of security to be taken more seriously. Throughout Jackson’s book, cultural and material factors interact in a dynamic manner, which results in some interesting findings that challenge the conventional wisdom on how France thought about national security during the era of the First World War. As a historian, Jackson is not interested in using a case study method to test rival hypotheses, which is the norm for many positivist-inclined political scientists. Instead, his aims are twofold: “first to reinterpret the course of French foreign and security policy during this period of upheaval and second to offer a case study for understanding the way policy-making elites adapt to seismic changes in their structural environment” (xii). He utilizes concepts from the ‘practice theory’ of sociologist Pierre Bourdieu to help navigate the complex relationship between cultural factors, especially the cultural predispositions of policy makers, and structural constraints. Jackson correctly notes that his focus on cultural factors to help explain policy outcomes has direct implications for the theoretical debate in IR between realism and constructivism. The rise of constructivism in IR since the end of the Cold War has been viewed as a direct challenge to structural realism. Simplifying to the extreme, constructivists emphasize the role of ideas, identities, and norms in the construction of social reality, while realists argue that a material structure derived from the distribution of power in the international system exists and that it imposes constraints on the behavior of rational actors. Thus for constructivists, anarchy is what states make of it, while for realists, anarchy is the structural condition of international politics that imposes a self-help, survival logic on the behavior of states. The theoretical divide between realists and constructivists is directly relevant to some of the other oppositions that inform Jackson’s portrayal of French security policy including the traditional versus international approaches to security, internal versus external pressures, and change versus continuity. Yet Jackson is less interested in proving the superiority of one pole of the dichotomy over another than he is in utilizing these antinomies to describe the evolution of French security policy during the period of the First World War. The dynamic tension between a traditional balance of power conception of security and an internationalist conception resting on inter-state cooperation and the rule of law provides the basic overarching structure of Jackson’s narrative of the evolution of French thinking about foreign and security policy from the years leading to the decision to wage war against Germany to the post-war period culminating in the support of Edouard Herriot’s government for the Geneva Protocol and Locarno Accords. In Chapter Two, Jackson examines these two competing conceptions of security, which he conceives as “historically specific regimes of knowledge that produced contending visions of peace and national security” (47). The traditional approach is largely synonymous with realism and realpolitik. The traditional view believes that the potential for conflict among nations is a permanent feature of international politics, which explains why the pursuit of power and security is ubiquitous. The traditional approach also endorses the logic of the balance of power, as war, according to realism, is less likely when there is a rough equality of power among the Great Powers and more likely when a single state possesses a disproportionate amount of power. . Jackson does, however, make the interesting observation that those who supported the traditional view, mainly those in the Foreign Ministry and army high command, actually advocated French strategic preponderance at Germany’s expense while at the same time couching their policy recommendations in terms of an équilibre européen. The idea of an unending antagonism between France and Germany whose resolution depended on French superiority either alone or in alliance with others, especially Russia, over a weakened Germany was, according to Jackson, held by French officials who subscribed to the traditional view of security. Although the traditional view regarding the centrality of power politics and the need for balancing has existed since at least the time that Thucydides wrote History of the Peloponnesian War, critics have continuously called the view into question on both theoretical and historical grounds. While Jackson does a superb job documenting the centrality of the traditional view in France’s war time and post-war thinking about its security interests, a view that has been shared and propagated by many historians, one of the central arguments of Beyond the Balance of Power is that an alternative view existed in France that believed the so-called logic of realism could be transcended, resulting in a more pacific world. His book is, in many ways, an attempt to illustrate this possibility through a carefully constructed narrative of French security policy. This becomes all the more apparent when Jackson turns his attention to the internationalist vision of security. His book displays an enormous effort to document the growing presence of internationalism in French foreign and security policy circles, as well as more broadly in French society. After all, Jackson’s central argument “is that internationalist ideas about peace and security played a much more important role in the evolution of French policy than is generally understood” and that “by the mid-1920s French policy makers were thinking beyond the balance of power” (14). Jackson provides a revisionist account of French security policy that challenges the largely taken for granted traditional view that has become the conventional wisdom. I am in no way insinuating that this results in a biased historical account, as Jackson’s perspicuous book is impeccably well documented. But I would suggest there is an element of truth to the notion that if one sets out to find something in history there is a distinct possibility that it might be found. Jackson notes that there has recently been a great deal of interest in the inter-war period, particularly among intellectual historians and disciplinary historians of IR. The prevailing view in IR is that the inter-war period is synonymous with idealism; that scholars writing during of the 1920s and 1930s were more interested in securing perpetual peace than dealing with empirical reality. Yet this view of the inter-war period has been systematically challenged by a new group of revisionist disciplinary historians who claim that the description of the interwar period as idealist is nothing more than a disciplinary myth. Rather than inter-war idealism, disciplinary historians have discovered that a range of ideas, opinions, and theories, including an extensive body of literature on imperialism and internationalism, characterized this period of disciplinary history in the United States and the United Kingdom. Jackson, however, faults IR scholars for ignoring the impact of French internationalism in the historiography of international relations. This is a rather minor point, but it does raise the issue of the connection between international historians and disciplinary historians. Jackson is not writing a disciplinary history of Political Science in France; in fact he never mentions the Ecole libre des sciences politiques, which is where political science was institutionalized in 1871. I am sure that most international historians would find this to be a much too limiting focus for reconstructing the history of internationalism. Yet it is incontrovertible that during the early decades of the twentieth century, a distinct discourse about internationalism can be found within the institutionalized academic context of IR in the United States and the United Kingdom. So while Jackson has set out to reconstruct French thinking about war and peace, this does not, contrary to what he indicates, imply that disciplinary historians of IR and political science are guilty of misrepresenting an early phase of international relations theory. And work on the disciplinary history of IR is expanding beyond the Anglo-American enterprise and literature specifically focused on IR in France now exists. Returning to the internationalist vision of security, Jackson not only aims to show its growing presence as the war dragged on and the bloodletting showed no signs of abating, but also argues that France embraced a distinct version of internationalism that has not received the recognition it deserves. Any attempt to distill the essence of internationalism is going to be fraught with difficulty, as the concept embodies a host of related concepts including cooperation, interdependence, legalism, international organization, multilateralism, peace, and perhaps republicanism. Jackson acknowledges the difficulty in defining internationalism, but is intent on distinguishing the French variant from liberal internationalism. He describes the French variant of internationalist thought as “juridical internationalism,” whereby the goal was to enmesh “Germany in a multilateral system based on the rule of law and backed up by the provision for the use of collective force” (5). This is a plausible definition and Jackson carefully unpacks its meaning and demonstrates how it increasingly gained political saliency during the period under study. Again, Jackson’s aim of articulating the internationalist vision is to counter the perception that French policy both before and after the war was solely wedded to realpolitik with the goal of achieving strategic preponderance over Germany. He argues that this perception has been especially detrimental to understanding France’s position in the negotiations leading to the Versailles settlement. There is no doubt that Jackson is successful in accomplishing the goal of revealing the neglected aspect of French internationalism during the period of the First World War. After reading Jackson’s book it would be hard to believe that anyone could possibly hold the view that internationalism was not present in France’s thinking about the post-war order. He does a first-rate job of showing how this outcome was the result of both internal, ideational factors and external material factors associated with the unprecedented degree of destruction and suffering that ordinary French and European citizens experienced. Which direction the causal arrows follow is not always entirely clear, but Jackson is on safe ground in showing how internal and external influences interacted in a dynamic manner. Perhaps it is not, as Jackson believes, a paradox that it took a terrible World War for internationalism to flourish. It was, after all, Immanuel Kant who argued that war and the endless preparation for war were the means by which states would finally come to the realization that they must abandon the state of nature and form a federation of peoples. While Jackson achieves his goal of demonstrating how the politics of national security in France is enhanced by viewing it in terms of a dynamic tension between opposing traditional and internationalist conceptions of security, he is less successful in clearly differentiating a French variant of internationalism from liberal internationalism. It seems to me that there are many points of convergence between the two, and it is important to realize that there was no monolithic internationalist position in either Britain or the United States. Just as in France, there were advocates for arbitration, collective security, disarmament, forceful sanctions, strengthened international law, international solidarity, and world government. Perhaps the most important commonality was the genuine and sincere belief that international politics could be transformed and the problem of war solved. Jackson gives American President Woodrow Wilson a prominent role in the evolution of France’s security policy away from a purely power-politics conception to one that embraced internationalism as the best way to ensure peace and security. And no one embodied the liberal internationalist conviction that international politics could be transformed beyond the balance of power than Wilson. The belief today among most liberals that the Kantian triangle of democracy, interdependence, and international institutions is the path to peace was also present in the magisterial story that Jackson has written. Just like that of the United States, France’s republican identity was viewed as being superior, and certainly more pacific, than that of autocratic states. It is this belief, I argue, that partially motivated, and continues to inspire, the desire to remake the world and end the scourge of war. The question remains whether internationalist ideas are sufficient to produce such a transformation. Jackson’s detailed study provides a fascinating case for considering this important question. What is the proper study of international history? In Beyond the Balance of Power, Peter Jackson broaches this question with an imaginative and nuanced analysis. His study of French foreign policy in the early decades of the twentieth century is conceptualized as a corrective to the nation-state and Realpolitik focused narratives of international history. Jackson argues for a reconsideration of the range of ideas, forms of power, and influence that shaped French foreign policy in the early twentieth century. In particular, he takes his methodological cues from the ‘new international history’, with its attention to the transnational setting of ideas, and to the idea of internationalism itself. In this context, going ‘beyond the balance of power’ as a shaping principle of international relations means recovering the history of engagement with the limits of that principle, and reintegrating ‘juridical internationalism’ as a specific set of ideas indigenous to modern French intellectual thought. The influence of internationalism on French foreign policy reached its climax in early 1925, when French Premier Edmond Herriot declared that the objective of his policy was “the internationalisation of security”. By this time, ‘seismic changes’ had taken place in French attitudes towards peace and security, and particularly towards the League of Nations (427). In over more than 400 pages of careful parsing and with generous attention to neglected primary sources—including documents related to the League of Nations—Jackson explains how the French arrived at that moment, and why French historians have, until now, failed to understand its political significance. Jackson argues that French historians, like international historians in general, have ignored not only the ‘ideological commitment to internationalism’ exhibited by Herriot and the ‘Cartel des gauches‘ that came to power in May 1924, but a much longer history of internationalist political thought. He builds his argument by drawing together evidence from the direct agents of foreign policy, the committees of ‘international financial experts’, and early twentieth-century French and international pacifist organizations that linked bankers, academics, lawyers, and politicians. National and international economic thought had a prominent influence on policy makers in this political story: namely, peace and cooperation were good for commerce. Jackson’s particular interest, however, is in the impetus of a longer tradition of internationalism advocated (most notably) by Leon Bourgeois at the Hague peace conferences of 1899 and 1907. Bourgeois’s outlook on foreign policy was both typical of French internationalism, and exceptional. He argued, like fellow French internationalists, that national security was best guaranteed through international arbitration backed up by international force. He based this view, however, on his own theory of ‘solidarism,’ an argument for the importance of national solidarity, translated into an international setting of the society of states. Solidarism confirmed that international society was as relevant as national society in thinking about security as a foreign policy objective (419). Until the 1920s, Jackson argues, the influence of this French juridical internationalism (with its emphasis on international arbitration) was stymied by the pull of a traditional ‘balance of power’ approach to foreign policy. ‘Balance of power’ had in its favour its status among a generation of French elites as a practical logic (a concept Jackson borrows from Pierre Bourdieu), and, especially during and after the First World War, the threat of the ‘German question’. There is much that is new here for the historian of internationalism, particularly the weaving together of the story of French foreign policy and the creation of the League of Nations. The book’s narrative pursuit of the waxing and waning status of the international (or idealist) and national (or realist) approaches to security through the early decades of the twentieth century contributes to the recovery of a lost history of peculiarly ‘French’ internationalism, with its emphasis on international cooperation, arbitration, and force. Jackson works that history to recontextualize not only the demeanour of individual statesmen such as Georges Clemenceau [now a “hard-boiled realist” and “committed democrat” (315)], but also pacts and treaties. This includes the efforts of Aristide Briand as Prime Minister in the late 1920s to have arbitration (rather than war) legitimated as the preferred method of resolving disputes between states, eventuating in the Kellogg-Briand Pact of 1928. On Jackson’s reading, that pact makes much more sense in the context of a longue durée history of the influence in France of internationalist thought. When it comes to national histories of French international politics, Jackson’s approach is innovative because he not only restores this internationalist trend, but he does so by making mention of the “politics of school teachers and the women’s movement” as contributors to the “political influence of anti-militarist responses to the great war” (443-4). Drawing on a range of new studies of French social movements and cultural history, particularly in support of the League of Nations, Jackson is able to track the impact of social developments on both the realism and idealism that drove new kinds of French security policy. This approach becomes important for understanding why internationalism constituted a political imperative in French foreign policy formulation in the mid-1920s and not before (unlike Britain for example, where, as Helen McCarthy has shown, there was an imposing centrist movement for a League of Nations already during the Great War). The answer is appropriately complicated. Beyond the Balance of Power abounds in historical ironies. As Jackson notes throughout, the French government (broken down to its individual, dominant statesmen and bureaucrats) predominantly advocated balance-of-power politics throughout almost the whole period he is studying. In 1919, when British and U.S. governments were planning a League of Nations—in the context of significant wartime centrist social movements in support of international governance— French politicians were focused on weakening Germany through territorial and economic means and the restoration of a ‘balance of power’. Succumbing to British and American pressure, Clemenceau (a traditionalist, who, Jackson shows, could swing both ways) appointed Bourgeois (a pacifist and militarist in this story) to the French committee on a League of Nations. Bourgeois used his position to promote his long-held juridical conception of international solidarism, and a future international organization with the power to enforce arbitration. However, the League that was established reflected a minimalist (realist) Anglo-American agenda, even though the pressure for a League had come from above and below precisely in those countries. By contrast, French (idealist) internationalists represented opposition to disarmament at the League of Nations, even though disarmament was one of the international organization’s key objectives. Whether read as an international history of France, or a national history of internationalism, Beyond the Balance of Power pushes international historians down new paths, beyond ‘traditional’ ‘realist’ and ‘realpolitik’ ‘balance of power’ historical paradigms. From one perspective, the book aims to convert the Realist international historians of French foreign policy to an embrace of evidence that they have preferred to ignore. Throughout, Jackson points to the limits of the existing historiography of French foreign policy in the interwar period, this emphasises only the reparations question, or more generally dismisses the relevance of any internationalist thinking, an omission that seems even more absurd in the context of a field that is defined through the evocation of the ‘international’ (351). Yet his study is also a testament to the power of historical and political paradigms. In this context, it invites further discussion of claims at the heart of his innovative approach, from the definition of internationalism, to the place of social history in international history, and the significance of the distinction between real and ideal conceptions of security. In Beyond the Balance of Power internationalism appears as a catchall term for a spectrum of foreign policy initiatives that were not purely state-centric or motivated by isolationist viewpoints. Jackson sees evidence of a French internationalism in support for a League, and international forms of arbitration, and for Franco-German cooperation, ‘regional mutual assistance’ (421), European and transatlantic multilateralism, and any arguments for cooperation rather than excommunication of states from the international community (whether Germany or the USSR). Can the term internationalism usefully bear the burden of all these forms of foreign policy, especially when we compare its use at the time in the circles of supporters of a League of Nations? The book’s cover, a painting of a French crowd assembled in the nationalist interests of the lost French territory of Alsace Lorraine, and looking on at statesmen on a podium in the background, is evocative of the importance of social history in Jackson’s story. However, Beyond the Balance of Power is more about the statesmen, and the crowd remains the sideshow. While this might be the proper balance in a book on foreign policy, when popular pressure is given such an important role at various points in the analysis—as an explanation of the status of traditional and idealist views of security, and of the relative status of the League of Nations in French politics—then it demands more attention. Instead, the relationship between government policies and popular opinion only comes to the fore at the end of the book, as Jackson addresses the mid-1920s, and the growing influence of “an increasingly large and well-organized pacifist movement in France” (429). Before then, social movements are acknowledged, but only thinly present, occasionally invoked as a determining influence on nationalist or internationalist trends. The extent of their presence, however, tempts us to that more impudent historical question: what is the place of social history in the analysis of international relations? Indeed, by taking pacifism and internationalism seriously, Jackson’s approach tantalises us with the possibilities! Finally, there is the framing antithesis of realist and idealist (also translated as traditional and international) politics. Beyond the Balance of Power goes a long way towards bringing back into international history ideas that have been left on the margins because of their status as ‘idealist’. Jackson attempts to unite the segregated histories of idealist and realpolitik foreign policy formulation, just as he restores the international to the conceptualization of national history. He tracks the rise and fall of both tradition and realism on the one hand, and internationalism and idealism on the other, and their interdependence as ideas. But the burden of including internationalism, and of showing historical balance and restraint, disciplines Jackson’s argument to the extent that at times it almost eviscerates the very evidence of internationalism he puts on display. In my mind it begs the question as to whether the historian has to be as sensitive to the realist/idealist dichotomy as the practitioners he is studying if we are really to move ‘beyond the balance of power’ as an historiographical paradigm? Just as Beyond the Balance of Power tells the story of how difficult it was to get beyond a ‘traditional’ political view in the age of nationalism, it reminds us too that in fundamental ways, international historians have barely begun the process of escaping the confines of that same national and ‘realist’ view of the nature of national politics, let alone international relations. In sum, Jackson’s book adds illuminating depth and complexity to a forgotten international history. His attention to the refinements of French ‘juridical internationalism’ will be to the benefit of students of internationalism as well as scholars of nationally defined French history. His methodological emphasis on individuals and on expanding the base of political history into the realms of international institutions, and social movements also sets new benchmarks for international historians. This is the kind of careful history that sets out openly to persuade and convert the historical practitioner as well as reader about the importance of paying attention to sources we consider beyond the pale of our often too well-defined views of the past. Peter Jackson has provided the best account available of French national security policy against Germany during the decade from 1914 to 1925, and one that will remain a standard point for further reference. Whereas archive-based historical analyses of the first half of this period remain sparse, the second half (and especially the period 1920-1925) has been closely worked over since the opening of the Paris archives made possible a new and more sympathetic appraisal of French policy. Jackson has important supplements to add to this work (much of it completed in the 1970s and 1980s), and his book is both very clearly presented and based very largely on exceptionally thorough research in the relevant official files and private papers. This investigation has been complemented by considerable research in Britain. The forbidding secondary literature on these themes has also been examined carefully, and Jackson’s footnotes will provide an invaluable guide to the article and monograph literature in the field. However, the book is less an international history than a survey of the principal aspect of French foreign policy during the decade in question. It focuses on security policy against Germany, but it traces this theme in all aspects – diplomacy, economics, military strategy, and public debate. Unsurprisingly, an enterprise of this magnitude has resulted in a very substantial book that has been ten years in the making. In the research-assessment driven British university environment, such commitment to an ambitious long-term project is admirable and rare. Jackson not only provides a story: he also has a theme. He distinguishes between ‘traditional’ and ‘internationalist’ approaches to French security policy, and argues that the influence of the latter has been neglected and understated. He is not afraid to name the historians whom he considers guilty of these omissions. The traditional approach – which he approximates to a balance of power policy – rested on strengthening France and weakening Germany through a combination of alliances, military preparations, and economic measures, and where possible by territorial readjustments. The ‘internationalist’ approach to security, by contrast, entailed not balancing Germany but integrating it with France and other countries in a mesh of multilateral political and economic engagements. ‘Juridical internationalism’ (which Jackson sees as distinctively French) placed special weight on clear legal definitions of acceptable and unacceptable behaviour, backed up by arbitration provisions and by collective sanctions applied more or less automatically against transgressors. Jackson identifies three key elite groups – the Third Republic’s parliamentarians; the Quai d’Orsay (Foreign Ministry) officials and French diplomats; and the military (i.e. army) chiefs. He considers that before 1914 hardly any members of these groups were wedded to internationalist approaches, with the exception of a few progressive politicians and Foreign Ministry lawyers. But by the end of the period, at any rate with the advent of the centre-left Cartel des Gauches governments that followed the May 1924 elections, internationalists did not monopolize the elite posts but they did hold the key roles in the Council of Ministers and at the Quai d’Orsay, while the military was discredited and marginalized. Hence the turn of French foreign policy from confrontation with Germany during the Ruhr occupation crisis of 1922-1923 towards conciliation and negotiation in 1924-1925 was not simply imposed on French governments by London and Washington but instead reflected very significant changes in the French domestic mood and in the balance of public opinion. Jackson acknowledges that this process took a long time to come to fruition. He rightly sees a first key date as being 1917, when the Tsarist Russian alliance collapsed, the French army mutinied, and anti-war opposition gained ground. In the initial phase of the war (at any rate behind the scenes) French security policy had aimed to weaken Germany as much as possible. After 1917 a contradiction opened between the various security methods, as France’s most promising future allies – Britain and America – did not want to see Germany excessively weakened or French territorial expansion in Europe. On the other hand, the government of Alexandre Ribot, the French Premier from March to September 1917, Jackson sees as significantly different from its expansionist predecessor under Aristide Briand, and more sincere about the League of Nations. The book is strong on the role of the Bourgeois Commission on the League in 1917-1918, referencing its deliberations within the context of a Gallic intellectual tradition (going back to Pascal) that justice and force must go hand in hand, and bringing out the contrasting underlying assumptions of Léon Bourgeois (the commission chair) and the international lawyers on the one hand and the those of the older generations of Quai d’Orsay diplomats on the other. He agrees with earlier commentators, however, that Georges Clemenceau (Premier in 1917-1919) was never committed to Bourgeois’s scheme. As regards the 1919 peace conference, Jackson stresses that the French delegation, guided particularly by Clemenceau and by André Tardieu (Clemenceau’s most important adviser on the French delegation), was not simply hard nosed and ‘realist’. On the contrary, it wanted to maintain a post-war liberal democratic ‘Atlantic’ or ‘North Atlantic’ alliance – and used such terminology in its internal documents. For this purpose Clemenceau was willing to compromise on his initial demand for Rhineland buffer states, which in any case was difficult to reconcile with the principle of self-determination. This raises the question of whether Clemenceau pursued it simply as a bargaining ploy, but Jackson thinks not. Once again, his account of the League of Nations issue at the peace conference is particularly informative, and clarifies the differences between the French and the Anglo-American concepts of international organization. It also makes clear that Clemenceau saw Léon Bourgeois’s work on the conference’s League of Nations commission, however, as a means of pressuring British Prime Minister David Lloyd George and American President Woodrow Wilson to concede on other issues. Clemenceau and Tardieu were internationalist in prioritising an alliance with the Anglo-Saxon democracies (as Clemenceau spelled out in parliament on 29 December 1918 and in his inner circle’s deliberations about the Anglo-American offer of a political guarantee on 14 March.) But they were not internationalist in being willing to dispense with territorial occupation as a supplementary guarantee, as they made clear when defending their handiwork to the parliamentary commission of inquiry (a defence that Jackson also handles well). None the less, their negotiating concessions triggered a confrontation between Clemenceau and the traditionalists, led by President of the Republic Raymond Poincaré and by the Allied supreme commander, Marshal Ferdinand Foch, in which the Premier carried the day. The crux of the book therefore lies in its post-1919 section and in its argument that the internationalist security approach prevailed in 1924-1925 (although Jackson sees a beginning of change during Briand’s tenure of the Foreign Ministry in 1921-1922). To that extent the 1914-1919 discussion is a prelude to what follows. Although the post-war period is notoriously complex, one of Jackson’s key points is that earlier writers have overstated the centrality of reparations and of financial imperatives in shaping French policy: at any rate until the foreign exchange crisis of early 1924 that drastically weakened Paris’s bargaining position. He gives much coverage to the role of Jacques Seydoux, the economics expert at the Quai d’Orsay, who was consistently willing to revise the Versailles treaty in the interests of establishing a Franco-German partnership in implementing it. In contrast, the voice of the Finance Ministry in the post-war deliberations is mainly absent (and he considers less significant than that of the Treasury in London). Through a close reading of the 1922 Cannes conference papers he shows that Briand as Foreign Minister would have been content to accept a political treaty with London, whereas for Poincaré, who succeeded him, only a military convention would do. This reviewer was particularly impressed by Chapter 11 on the origins of the Ruhr occupation, which insists that that initiative should not be seen (as Poincaré’s rhetoric initially suggested) as a reluctant venture dictated mainly due to financial imperatives. On the contrary, it was much more purposive, and driven by the ambition of breaking down Germany’s political unity – and relatively recently released documents (notably the records of a meeting at the Elysée Palace on 27 November 1922) are cited in support of this interpretation (402). … even if we are stronger today and will remain so for another decade, in twenty to fifty years the weight of 70 million organised and hard-working Germans will ultimately overcome that of 38 million Frenchmen. If therefore we do not succeed in the creation of a German republic hostile to war, we are doomed. Far from gaining ground among democratic opinion, we ceaselessly attract its hatred (425). As we now know, the gamble on Weimar democracy failed, and, as Jackson finally acknowledges, “In the end, Foch was right” (521). It is only on the penultimate page that he does so, however, and it is not entirely convincing to suggest that because a more multilateralist approach towards Germany succeeded after 1945 it could also have done so in the inter-war years (522). In fact Germany was contained as well as conciliated in the post-1945 settlement (and even in its post-1990 successor). The assumptions underlying the traditional approach of Foch and others were that because Germany was both irremediably hostile and possessed inherently superior resources, France’s security depended critically on being able to enforce the Versailles Treaty. For that reason, defeat in the enforcement effort of 1923-1924 meant the long-term outlook was bleak. But the key problem, especially given France’s financial vulnerability, was that it could not break up Germany – or indefinitely maintain the Rhineland occupation and the disarmament clauses – without Anglo-American assistance, and that assistance, as emerges from Jackson’s as from earlier assessments, was unforthcoming. French policymakers may have played a bad hand poorly; but it was the bad hand that mattered. A comprehensive verdict on the tragedy of European inter-war diplomacy therefore requires a judgement on British, German, and American policy, as well as on that pursued in Paris. Responding to book reviews is never straightforward. This is true even when the reviewers in question have obviously read my book with care and have been, if anything, overgenerous in their comments. I am deeply grateful to Keith Neilson, Brian Schmidt, Glenda Sluga and David Stevenson for having taken the time to read the book (it is very long!) and for offering up such interesting reflections and judicious critiques. Ideas tend to take on a life of their own once they enter the public domain. While none of the reviewers have done violence to the ideas and arguments advanced in Beyond the Balance of Power, they tend to interpret its central purpose differently. This is noteworthy particularly because the core aims of the project changed considerably over time. At the outset I wanted to write a short book on the making of French strategy and diplomacy between the wars. By the end I was trying to integrate three distinct historiographies into a study of French foreign and security policy before, during, and after the First World War. I wanted, in particular, to show how the prevailing picture of French policy changes dramatically if one takes into account recent work on the history of internationalism and the cultural history of the First World War. It proved difficult to come up with a suitable conceptual framework. My solution was to organise thinking about security along a spectrum with ‘traditional’ balance of power approaches at one end and ‘internationalist’ approaches based on multilateral co-operation and the creation of international institutions at the other. This strategy no doubt reflects my having spent twelve years among International Relations theorists at Aberystwyth University. I profited from sustained exposure to the ‘great debates’ that structure that discipline: ‘realism’ versus ‘idealism’; ‘realism’ versus ‘liberalism’ (or ‘liberal institutionalism’); and, most recently, ‘realism’ versus ‘constructivism.’ Many historians find these debates misleading because they sacrifice detail and nuance in pursuit of theoretical clarity and ‘parsimony.’ My own view is that engaging with debates in IR can enrich international history precisely because such engagement forces the historian to ask big questions about the nature of international politics – or at least to keep those big questions in mind while one is research and writing about more specific issues and events. Keith Neilson is certainly right to stress my call for a more rigorous approach to the cultural history of international relations. I have long been frustrated with the way many practitioners of the ‘cultural turn’ in international history fail to explain exactly what they mean by ‘culture.’ Culturalists tend to stress the importance of ‘identity’ as a source of understandings, strategies, and actions. But too often they deploy identity as a more or less static phenomenon, essentially independent of the structural context in which the actor is operating. As a result, it becomes an interpretive framework in its own right that is used as to explain almost everything and therefore ends up explaining very little. I have always held that identities change constantly to adapt to different social contexts. This on-going and reciprocal dynamic between identities and outside structures gets lost in most post-modern theorising about ‘alterity’ and ‘hybridity.’ To my mind, the social theory of Pierre Bourdieu provides a better framework for thinking about both the origins of culture and its interaction with ‘structural’ factors to shape the strategies developed by social actors. I therefore tried to deploy Bourdieu’s ‘practice theory’ to address the key questions ‘where does culture come from?’ and ‘how did it shape decision-making?’ Whether anyone pays any attention to my argument for an alternative approach to the ‘cultural turn’ remains to be seen. Brian Schmidt is very kind about my attempts to engage with, and possibly even contribute to, contemporary debates in the discipline of IR. He correctly points out that the interpretation advanced in Beyond the Balance of Power is concerned chiefly with the role of ideas. I sought to show how changes in both the domestic and international environments combined to create political space for internationalist ideas to exert greater influence. Schmidt is of course right to point out that “if one sets out to find something in history there is a distinct possibility that one will find it.” It is entirely possible that I have exaggerated the influence of internationalist ideas. My only response must be that I did not initially set out to find the influence of internationalism in French policy. It just kept turning up where I wasn’t expecting to find it. This forced me to reconsider many of my fundamental assumptions about the period and, ultimately, to recast the scope and character of the book I was trying to write. Where I would disagree with Brian is over the way the history of IR theory is typically understood within that discipline. The fairly sophisticated theories of international peace developed by French internationalists such as Léon Bourgeois, Théodore Ruyssen, Georges Scelle and Célestin Bouglé are entirely absent from existing accounts of the origins and evolution of ‘IR theory.’ The fine collection of essays edited by Brian just last year, International Relations and the First Great Debate, is a good illustration of this state of affairs. One searches in vain for any reference to French international thought in this important volume. This lacuna is regrettable because there are interesting stories to tell. The more liberal strand of French international thought, for example, applied the domestic political theory of solidarisme to international relations. French internationalists laid great emphasis on the need for states to accept responsibilities to one another in order to create an international system based on the rule of law. That meant accepting limitations to their sovereignty in the international sphere just as individuals are obliged to do in the domestic sphere. There are interesting parallels between this conception and much of the ‘Anglo-Saxon’ international theorising examined by Hidemi Suganami in his important work on the ‘domestic analogy.’ Also noteworthy is the fact that sociology greatly influenced turn-of-the-century international theory in France and remains an integral part of French IR today. Many of the most influential IR theorists, from Raymond Aron to Didier Bigo, come from that discipline. Hence I contend that existing accounts of the emergence of international relations as a discipline have misrepresented the diversity of this early phase of international theory. I hoped to help rectify this misrepresentation in my discussion of the origins and evolution of a distinctively French approach to international peace. Whether I succeed depends on the audience that my book finds among IR specialists. And I am painfully aware that I didn’t do myself any favours in this regard by writing such a long book. Internationalism and transnationalism are not easy categories to define. Accordingly, I sought first to develop a working definition for the purpose of the book and to stick to it. I defined it as “a doctrine that looked to the creation of institutions beyond the nation-state as the best means to promote economic progress and prevent war” (3). This is admittedly a broad category. But it has the virtue of sitting in opposition to those ‘traditional’ conceptions that sought security through preponderant military and economic power and self-help strategies such as exclusive alliances and coordinated war planning directed at third parties. The definition allows one to maneuver between approaches inspired primarily by the internationalist vision of security and those based on more traditional strategies. The terms ‘internationalist’ and ‘traditional’ must be understood as ideal types. Nearly all policy elites occupied positions on a spectrum between these two positions. And traditional and internationalist ideas often co-existed in the minds of individuals within the policy elite. As a consequence, policy initiatives were usually hybrid affairs that combined both internationalist and traditional elements. The Clemenceau government’s peace plan in 1919 and French policy leading up to the 1925 Locarno Accords are two good examples of this amalgamation of contending influences. I discern an important shift towards the internationalist position as ideas linked to cooperation and the need for an international organisation gained traction both inside and outside France during this period. The challenge of understanding the impact of popular attitudes on policy formulation is formidable. It is virtually impossible to know the precise state of ‘public opinion’ on a given issue at a given moment in the present, let alone the past. The historian must perforce generalise, and is dependent on the sources available. Sluga rightly observes that the book provides much more detailed analysis of the role of public opinion after the armistice, and during the 1920s in particular. The nature of the evidence reflects the methodological challenges posed by the politics of censorship, and, perhaps more importantly, patriotic self-censorship, within the wider context of the wartime Union sacrée. There are frustratingly few public sphere sources to work with when trying to gauge the character of popular attitudes in France for most of the First World War. One is obliged to rely on the heavily censored press, other forms of cultural production such as books, cinema, art and theatre (which incidentally were also subjected to close surveillance), internal debates within social movements and political parties, and, finally, the subject and tone of parliamentary debates and debates within parliamentary commissions. Also useful are the reports on public attitudes compiled by police prefectures across France. All of those sources have been exploited extensively over the past three decades. The resultant secondary literature proved invaluable to my attempts to track the growth of support for internationalist themes within the public sphere. But there is no getting around the fact that far more direct evidence of public support exists for these themes once censorship was relaxed after the armistice. Sluga’s final point underlines the problem inherent in framing any analysis around the binary concepts of ‘realism’ and ‘idealism.’ In response I can only agree. That is the main reason I used the concepts of ‘traditional’ and ‘internationalist’ rather than ‘realist’ and ‘idealist.’ I took care not to label internationalists as ‘idealists.’ This was not how internationalists understood their ideas at the time. The ‘idealism’ label was imposed on internationalism later (we can thank E.H. Carr, in particular, for this clever exercise in intellectual ‘branding’). And yet, Sluga’s argument that historians need to “escape the confines’ of ‘a national and realist” view’ of the nature of politics’ does not fully persuade me. It is true if one is writing about the nature of politics and international relations. But that is not the aim of Beyond the Balance of Power. It is instead a study of the impact of the First World War on the politics of national security in France. The focus is on the conceptual horizons of those political, diplomatic, and military elites responsible for its formulation. And I tried to cast my net as wide as possible in order to consider the influence of actors not directly involved in the making of policy. But it would do violence to the evidence at hand to ignore the power and durability of the traditional approach in policy-making. It will be obvious to most readers that I consider this approach to have been at times backward-looking and inspired by an outdated vision of France’s role in the world. But that was doubtless part of its appeal. No historian has made a greater contribution to our understanding of the First World War than David Stevenson. His work on the origins and course of the conflict are indispensable to any study of the period. It has shaped my own approach in fundamental ways. Three elements of his review are of particular interest because they raise important issues that may be of wider interest to readers of H-Diplo. First, Stevenson makes the astute observation that the year 1917 constitutes a pivot upon which the book’s argument turns. The collapse of Imperial Russia, the ally with whom France negotiated the most traditional agreements respecting the post-war order, changed the character of the war in crucial ways. Just as important was the entry of the United States as an ‘Associated Power.’ Thereafter the war could be represented as a struggle for democracy against the forces of autocracy (in Europe at any rate). Depicting the conflict in this way provided powerful legitimacy for the norm of self-determination, an idea that had grown in influence over the course of the nineteenth century. The consequences of this new legitimacy became manifest in the character of the peace settlement. But American entry was just as important in bolstering internationalist discourses around the need to reform the practice of international politics and in particular to replace the balance of power and the rule of force with international cooperation and the rule of law. The above developments opened up space for internationalism to shape public debate on foreign policy inside France. For these reasons I am not sure that the post-1919 period is really “the crux of the book” (as Stevenson suggests). I would instead point to the seismic transformations of 1917. All the major forces that shaped the international politics of the Twentieth Century were set in train in 1917. Afterward, French foreign and security policy was never the same. The second issue revolves around the extent to which attempts at European stabilisation during the 1920s anticipated the European order that emerged after 1945. Stevenson considers it “not entirely persuasive to suggest that because a more multi-lateralist approach towards Germany succeeded after 1945 it could also have done so in the inter-war years.” I would respond that, in the long-run, such a strategy was the only way to deal with Germany in a system based on self-determination. My views on this point are not original. This argument was made by Marc Trachtenberg and especially Walter McDougall back in the late 1970s and early 1980s. Building upon their work, I stress the importance of enmeshment to various French attempts to reintegrate Germany after 1918. The underlying idea was to create a multi-lateral system capable of constraining German behaviour. Some key figures, including Aristide Briand in his post-1918 incarnation, went so far as to argue that membership in a wider community of nations might have a socialising effect on Germany’s leadership. Others focused only on the restraining power of multi-lateral institutions backed up by the clear threat of force. The key point is that this approach rested on more than balance-of-power thinking. There was an internationalist dimension to the multilateral security regime the French attempted to construct both during the peace conference of 1919 and particularly after 1924. That this strategy proved unworkable once the economic and political upheaval of the early 1930s revolutionised the European political landscape is impossible to deny. Hence my ill-judged phrase “In the end, Foch was right” (521). I now regret writing this. It is true that French Marshal Ferdinand Foch’s bleak analysis of the future seemed persuasive viewed from the perspective of 1940. But it is less persuasive in 2014. Foch erred in asserting that the German national character was immutable. He was also wrong to insist that the German population was congenitally unsuited to democratic forms of government. To make this point is to underline the importance of contingency in history. The course of European politics in the 1930s was unknowable to those making policy in 1919 or 1925. The radicalising effects for international relations of both the great economic crisis and the rise Nazism could not be foreseen. And there was no failed precedent for the pursuit of peace through an international organisation, the rule of law, and collective security. These ideas had never before been tried. If our duty as historians is to understand first and to pass judgement second, this should temper judgements about the inherent foolishness of internationalist ideas. In any case, the crucial failures for France came later when its leadership failed to adapt to the much different and more dangerous environment of the 1930s. The third issue relates to the nature of international history. It is often asserted that ‘true’ international history must be based on archival work in multiple national contexts: the more national perspectives the better. Stevenson echoes this particular representation of our field when he describes my book as “less an international history than a survey of the principle aspect of French foreign policy during the decade in question.” I find this definition of international history questionable. I do not think Stevenson means it in this way, but often, when one strips away the veneer of this claim, we are left with an attempt to establish one particular approach as the only legitimate way to practice international history. And yet, if our subject is the history of international relations, then surely the foreign and security policy of one of the most important state actors constitutes a legitimate part of this subject and must therefore be termed international history. I sought particularly to investigate the cultural dynamics of French policy-making and to analyse their interaction with wider structural forces that shaped policy options. That meant detailed research into the social background, education, formal and informal training, and day-to-day practices of those politicians, diplomats, and soldiers involved in the policy process. The strategy was to identify the ‘practical logics’ (Bourdieu’s term, although others might use the language of ‘institutional cultures’) that conditioned responses to the security challenges facing France before, during, and after the First World War. I tried to go further, however, to consider the extent to which cultural reflexes were adapted to changes in the structural environment both inside and outside France. Such an enterprise would have taken fifty years had I tried to conduct a similar investigation into the policy-making dynamics of all of the great powers during this period. The only solution was to read as widely as possible in the secondary literature and to use this reading to reconstruct the international context in which policy was made. This is what I tried to do. The idea that such an undertaking does not constitute international history seems to me passing strange. Scholars writing from the perspective of ‘transnational history’ may be inclined to criticise my focus on state policy-making as just another exercise in reifying the nation-state as the ‘natural’ actor in international politics and the only legitimate object of study for international historians. That is emphatically not my intention. Our field has been enriched immeasurably by the ‘transnational turn.’ Indeed, I could not have written this book had I not been able to draw on the insights and empirical contributions of scholars working on transnational movements for peace and international cooperation. But acknowledging the importance of the transnational approach does not require us to renounce all study of the state. The fact is that states are now more powerful than ever. They intrude in our lives in ways that seemed unimaginable less than a quarter of a century ago. The state will not go away just because we choose not to study history from a ‘statist’ point of view. My hope, therefore, is that Beyond the Balance of Power will make a modest contribution to the ‘cultural turn’ in international history by integrating the history of internationalism into the study of state foreign and security policy-making. Robert Boyce, The Great Interwar Crisis and the Collapse of Globalization (London, 2009); Patrick O. Cohrs, The Unfinished Peace after World War I: America, Britain and the Stabilisation of Europe, 1919-1932 (Cambridge, 2006); and Zara Steiner, The Lights that Failed: European International History, 1919-1933 (Oxford, 2005). The list is long but examples include Glenda Sluga, Internationalism in the Age of Nationalism (Philadelphia, PA, 2013), 45-78; Michael C. Pugh, Liberal Internationalism: The Interwar Movement for Peace in Britain (Houndmills, Basingstoke, 2012); Daniel Laqua, ed., Internationalism Reconfigured: Transnational Ideas and Movements between the World Wars (London, 2011); Helen McCarthy, The British People and the League of Nations: Democracy, Citizenship and Internationalism, 1918-1945 (Manchester, 2011); Verena Schöberl, “Es gibt ein grosses und herrliches Land, das sich selbst nicht kennt..Es heisst Europa’: Die Diskussion um die Paneuropaidee in Deutschland, Frankreich und Grossbritannien, 1922-1933 (Berlin, 2008); and Jean-Michel Guieu, Le Rameau et le glaive: les militants français pour la Société des Nations (Paris, 2008). Patricia Clavin, Securing the World Economy: The Reinvention of the League of Nations, 1920-1946 (Oxford, 2013); and Susan Pedersen, “Back to the League of Nations,” American Historical Review 112 (2007), 1091-1117. Peter Jackson, France and the Nazi Menace. Intelligence and Policy Making 1933-1939 (Cambridge: Cambridge University Press, 2000). While interpretations vary, they share this commonality; cf. J.F.V. Keiger, France and the Origins of the First World War (London and Basingstoke: Macmillan, 1983) and Stefan Schmidt, Frankreichs Außenpolitik in der Julikrise 1914 (München: R. Oldenbourg Verlag, 2009). Recent books on the origin of the war all share this view; see Christopher Clark, The Sleepwalkers. How Europe went to war in 1914 (London: Allen Lane, 2012), T.G. Otte, July Crisis. The World’s Descent into War, Summer 1914 (Cambridge: Cambridge University Press, 2014) and Gordon Martell, The Month that Changed the World. July 1914 (Oxford: Oxford University Press, 2014). Fundamental is W. McDougall, France’s Rhineland Policy Diplomacy: The Last Bid for a Balance of Power in Europe (Princeton: Princeton University Press, 1978) and see Stephen Schuker, The End of French Predominance in Europe. The Financial Crisis of 1924 and the Adoption of the Dawes Plan (Chapel Hill: University of North Carolina Press, 1977). For thoughts on this matter, see two articles by David Reynolds, “International History, the Cultural Turn and the Diplomatic Twitch,” Cultural and Social History, 3 (2006), 75-91 and “From the Transatlantic to the Transnational: Reflections on the Changing Shape of International History,” Diplomacy & Statecraft, 24 (2013), 134-148. Those interested in this can follow Jackson’s use of Bourdieu in “Pierre Bourdieu, the ‘Cultural Turn’, and the Practice of International History,” Review of International Studies, 34 (2008), 155-181. Donald Watt, “The Nature of the Foreign-Policy-Making Elite in Britain,” in D.C. Watt, ed., Personalities and Policies (University of Notre Dame Press, 1965), 1-18. See, for example, Colin Elman and Miriam Fendius Elman eds., Bridges and Boundaries: Historians, Political Scientists and the Study of International Relations (Cambridge, MA: MIT Press, 2001). See Ted Hopf, “The Promise of Constructivism in International Relations Theory,” International Security 23 (Summer 1998) and Dale Copeland, “The Constructivist Challenge to Structural Realism,” International Security 25 (Fall 2000). See Alexander Wendt, “Anarchy is What States Make of it: The Social Construction of Power Politics,” International Organization 46 (Spring 1992) and John J. Mearsheimer, The Tragedy of Great Power Politics (New York: W.W. Norton, 2001). Examples include Inis L. Claude, Power and International Relations (New York: Random House, 1962), Paul Schroeder, The Political Transformation of European Politics, 1763-1848 (Oxford: Oxford University Press, 1994), and Richard Little, The Balance of Power in International Relations (Cambridge: Cambridge University Press, 2007). Brian C. Schmidt eds., International Relations and the First Great Debate (London: Routledge, 2012). See Peter Wilson, “The Myth of the ‘First Great Debate’” Review of International Studies 24 (1998) and David Long and Brian C. Schmidt eds., Imperialism and Internationalism in the Discipline of International Relations (New York: SUNY Press, 2005). See, for example, Klaus-Gerd Giesen, “France and other French-speaking countries (1945-1994),” in Knud Eric Jorgensen and Tonny Brems Knudsen eds., International Relations in Europe: Traditions, Perspectives, and Destinations (London: Routledge, 2006) and Henrik O. Breitenbauch, International Relations in France: Writing between Discipline and State (London: Routledge, 2013). Immanuel Kant, “Idea for a Universal History with a Cosmopolitan Purpose,” in Hans Reiss ed., Kant: Political Writings (Cambridge: Cambridge University Press, 1991). See for example, Sunil Amrith and Glenda Sluga, ‘New Histories of the UN’, Journal of World History, 19, 3, September 2008, 251-274; Daniel Laqua, ed., Internationalism Reconfigured. Transnational Ideas and Movements between the World Wars, London, I. B. Tauris, 2011; and Robert Frank, ed., Pour l’histoire des relations internationals (Paris, PUF 2012). Here the new histories of the League of Nations movements in France are particularly important, see Carl Bouchard, Le citoyen et l’ordre mondial (1914-1919) (Paris, Editions A. Pedone, 2008) and Jean-Michel Guieu, Le rameau et le glaive: Les militants français pour la Société des Nations (Paris, Presses de Sciences Po, 2008). Helen McCarthy, The British People and the League of Nations: Democracy, Citizenship and Internationalism, c.1918-1945 (Manchester, Manchester University Press, 2011). See also, Glenda Sluga, Internationalism in the Age of Nationalism (Philadelphia, University of Pennsylvania Press, 2013). Brian Schmidt (ed. ), International Relations and the First Great Debate (London, 2013). Hidemi Suganami, The Domestic Analogy and World Order Proposals (Cambridge: Cambridge University Press, 1989). On this difficulty see especially Patricia Clavin, “Conceptualising Internationalism between the World Wars” in D. Lacqua (ed. ), Internationalism Reconfigured: transnational ideas and movements between the World Wars (London, 2011), and “Time, Manner, Place: Writing European History in Transnational and International Contexts”, European History Quarterly 40 (2010) and Sluga’s own Internationalism in the Age of Nationalism (Philadelphia, 2013). Somewhat ironically, what IR theorists nowadays refer to as ‘realism’ is founded on an idealist philosophical position. Walter McDougall, “Political Economy versus National Sovereignty: French structures for German economic integration after Versailles”, Journal of Modern History, 51 (1979): 4-23; Marc Trachtenberg, Reparation in World Politics: France and European Economic Diplomacy, 1916-1923 (New York, 1980). I have developed this argument further in Peter Jackson, “Deterrence, Coercion, and Enmeshment: French Grand Strategy and the German Problem after World War”, in J.W. Taliaferro, N. Ripsman and S. Lobell (eds. ), The Challenge of Grand Strategy: The Great Powers and the Broken Balance between the World Wars (Cambridge, 2012), 37-62. Pierre Renouvin and Jean-Baptiste Duroselle, Introduction à l’histoire des relations internationales, (Paris, 1964), esp. chapters 11 & 12. Paul Kennedy, The Realities Behind Diplomacy: Background Influences on British External Policy (London, 1981).